[190 Pages Report] The study involves four main activities to estimate the current size for the exhaust system market. Exhaustive secondary research was done to collect information on the market, such as after-treatment devices and various exhaust components. The next step was to validate these findings, assumptions, and market analysis with industry experts across value chains through primary research. Bottom-up approaches were employed to estimate the complete market size for different segments considered under this study. The secondary sources referred for this research study include automotive industry organizations such as the Organisation Internationale des Constructeurs d'Automobiles (OICA); corporate filings (such as annual reports, investor presentations, and financial statements); and trade, business, and automotive associations. Secondary data has been collected and analyzed to arrive at the overall market size, which is further validated by multiple industry experts. Extensive primary research has been conducted after acquiring an understanding of the exhaust system market scenario through secondary research. Several primary interviews have been conducted with market experts from both the demand- (OEMs) and supply-side (exhaust system and after-treatment devices manufacturers) across major regions, namely, North America, Europe, Asia Oceania, and Rest of the World. Primary data has been collected through questionnaires, emails, and telephonic interviews. In the canvassing of primaries, we have strived to cover various departments within organizations, such as sales, operations, and administration, to provide a holistic viewpoint in our report. The bottom-up approach has been used to estimate and validate the size of the exhaust system market. The exhaust system market size by after-treatment devices, in terms of volume, is derived by multiplying the country-level fuel breakup for each vehicle type with country-level production of each vehicle type (passenger car, LCV, truck, and bus) and country-level after-treatment device penetration (which is estimated using secondary research and then validated by primary interviews) for each vehicle type. The country-level after-treatment device market size, by volume, is multiplied with country-level average OE price (AOP) of each after-treatment device for each vehicle type to get the country-level after-treatment device market, by value. The summation of the country-level market would give the regional level, and then further addition provides the global exhaust system market, by after-treatment device (DOC, DPF, LNT, SCR, and GPF). The total value of each country is then summed up to derive the total value of the exhaust systems market, by after-treatment device. Similar methodology has been followed for exhaust systems market, by component (catalytic converter, engine downpipe, exhaust manifold, mufflers, sensors, and tailpipe), and off- highway vehicle (construction equipment and agriculture tractor) on the basis of after-treatment device (DOC, DPF, and SCR). All percentage shares, splits, and breakdowns have been determined using secondary sources and verified by primary sources. All parameters that are said to affect the markets covered in this research study have been accounted for, viewed in extensive detail, and analyzed to obtain the final quantitative and qualitative data. This data has been consolidated, enhanced with detailed inputs and analysis from MarketsandMarkets, and presented in the report. 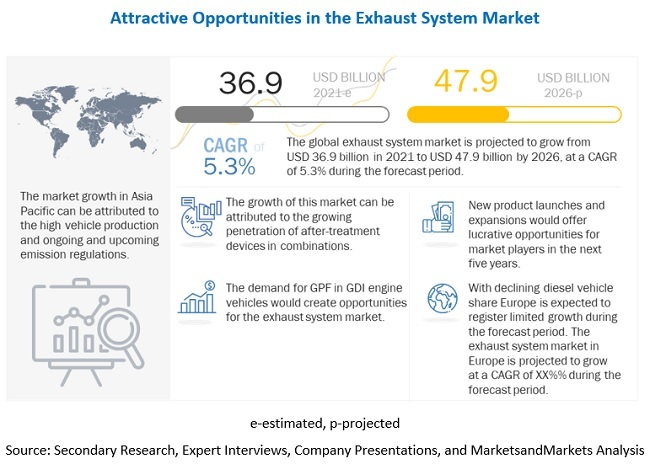 The data was triangulated by studying various factors and trends from both, the demand and supply sides, in the exhaust system market. This research report categorizes the exhaust system market based on after-treatment device, component, vehicle type, off-highway vehicle type, aftermarket, and region. 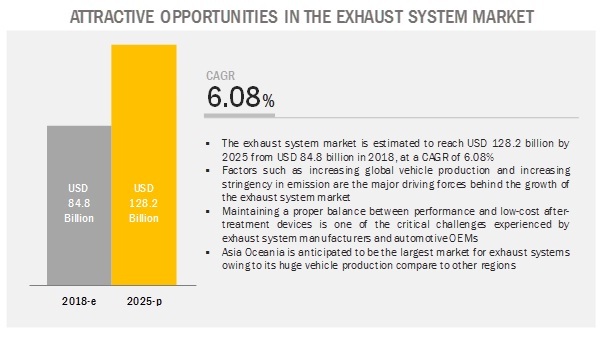 The exhaust system market is estimated to be USD 84.8 billion in 2018 and is projected to reach USD 128.2 billion by 2025, at a CAGR of 6.08%. 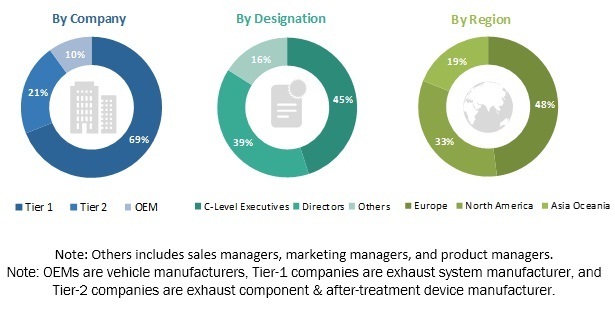 Increasing vehicle production, continuous upgrades in emission regulation, upcoming emission-related regulatory compliances in developing countries, and technological partnerships between OEMs and Tier I players are projected to drive the exhaust system market. The SCR technology offers benefits including enhanced nitrogen oxide (NOx) reduction than LNT by nearly 90%, and hence, it is mostly preferred in diesel vehicles across the globe. SCR has a maximum installation rate in European and North American countries owing to the ongoing emission norms such as Euro 6 and Tier 3 respectively. Europe has a large adoption rate of diesel passenger cars and LCVs. Thus, it has a higher installation rate of SCRs compared to other regions such as Asia Oceania and North America in these vehicle types. Further, the newer trucks and buses of developed countries must withstand the NOx permissible limits and should be fitted with SCRs. Moreover, owing to the ongoing and upcoming stringent emission norms in developing countries such as China, India, and Thailand, the demand for SCRs is expected to increase significantly across all diesel vehicle types by 2022 at a global level. LDVs comprise passenger cars and LCVs. In LDV, passenger cars hold the largest market share for the after-treatment devices owing to the maximum vehicle parc. According to MarketsandMarkets analysis, the contribution of passenger cars in the overall vehicle parc stood at nearly 70–75% in 2017 which is anticipated to grow at a prominent rate in the coming years. Also, emission regulations are getting more stringent for all vehicles. Between the Euro 4 to Euro 6, PM and NOx levels have reduced significantly. This has prompted the installation of DOC, DPF, and SCR in older vehicles which has further spurred the demand for after-treatment devices in the aftermarket for passenger cars. On the other hand, along with the passenger cars, the emission norms are getting tighter for LCVs that further lead to the implementation of after-treatment devices. Asia Oceania has the largest market share of vehicle production with about 54–56% of the total vehicle production. China, India, and Japan are the largest vehicle production hubs because of rising urbanization, increasing GDP, and industrialization among others. With the growing vehicle production, vehicle emissions have also increased significantly. Considering this, few countries such as China, Japan, and India have implemented vehicle emission norms. For instance, China and India are currently running on China IV and BS IV. However, they are planning to implement China VI and BS VI by 2020 which is equivalent to Euro VI. Moving toward strict emission norms will create a huge demand for various after-treatment devices. In Asia Oceania, China and Japan are the leading countries for the exhaust system market, by after-treatment device. Some of the key players in the exhaust system market are Faurecia (France), Tenneco (US), Continental (Germany), Eberspächer (Germany), Futaba Industrial (Japan), Benteler International (Austria), Friedrich Boysen (Germany), Yutaka Giken (Japan), Sejong Industrial (South Korea), and Bosal (Belgium). Faurecia is anticipated to be a dominant player in the exhaust system market. Faurecia adopted the strategies of expansion, new product development, partnership, and merger & acquisition to retain its leading position in the exhaust system market. Strengthening the product portfolio and global presence by building customer relationships, Faurecia has left a mark not only in the current market but also in emerging markets such as India. This is the strategy that Faurecia is following to maintain its leadership in the exhaust system market. In June 2018, Continental opened a combined production and storage facility for NOx sensors in Trutnov, Czech Republic. The two surface-mount technology (SMT) production lines would produce printed circuit boards, which will help in enhancing the NOx sensors manufacturing. These electronic components detect NOx in the exhaust gas of a vehicle and provide the data for the effective conversion of NOx into harmless substances. In February 2017, Eberspächer mass produced the exhaust systems featuring GPF. Using the special filters means the soot particle content in the exhaust gas is well below the legal limit. As a result, the systems conform to the upcoming level of the Euro 6 emissions standard. The filters also minimize the vehicle's exhaust noise. In May 2018, A Chinese subsidiary of Sejong Industrial, Taicang Sejong Auto Parts Co., Ltd. reached an agreement with Changan Automobile for supplying mufflers worth USD 101.8 million to the Chinese automaker. The products are designed for 3 new models whose mass production is slated to begin in 2019. Taicang Sejong Auto Parts plans to boost its annual sales to USD 254.5 million by 2021. Which after-treatment device is going to dominate in the future? How are the industry players addressing the challenge of maintaining a balance between performance and low-cost diesel after-treatment devices? When is SCR going to get mass adoption in the exhaust system market for all vehicle types? What could be the market size of exhaust systems for off-highway vehicles? What could be the market size of exhaust systems for the aftermarket?